New coach Freddie Kitchens said Chubb won't back down from any backfield competition that arises in 2019, Keith Britton of Sports Radio 92.3 The Fan Cleveland reports. Chubb totaled 24 rushing yards on nine carries in Sunday's 26-24 loss to the Ravens. He added two receptions for minus-4 yards. Chubb rushed for 112 yards on 19 attempts, adding two receptions for three yards during Sunday's 26-18 win against the Bengals. Chubb rushed 20 times for 100 yards during Saturday's 17-16 win over the Broncos. He failed to catch his lone target. 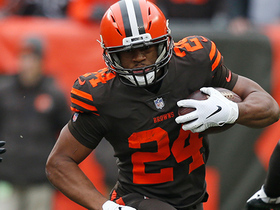 Analysis: Chubb broke off a 40-yard run to essentially seal Cleveland's victory in the fourth quarter, as the rookie reached the century mark for the third time this season. Though he found success on the ground, his five-game touchdown streak came to end. He also wasn't involved in the passing game, failing to catch a pass for the first time since Oct. 21 against the Buccaneers. He'll look to keep up his impressive debut season next Sunday when the Browns square off against the Bengals. Chubb rushed 13 times for 66 yards and a touchdown while adding four catches for 17 yards on six targets in Sunday's 26-20 win over the Panthers. Analysis: Chubb extended his touchdown streak to five games, turning a 20-17 deficit into a 23-20 lead early in the fourth quarter. He's carried the ball just 23 times over the past two weeks after logging 18-plus carries in each of the previous five, but the minor questions about Chubb's workload are overshadowed by his major scoring ability. Up next for the rookie running back is a Week 15 date with second cousin Bradley Chubb and the Broncos. Chubb rushed nine times for 31 yards and a touchdown while catching all three of his targets for 41 yards in Sunday's 29-13 loss to Houston. Chubb rushed 28 times for 84 yards and a touchdown while catching all three of his targets for 44 yards and another score in Sunday's 35-20 win over Cincinnati. Chubb rushed 20 times for 176 yards and a touchdown while catching all three of his targets for 33 yards and another touchdown in Sunday's 28-16 win over the Falcons. Analysis: Chubb caught a 13-yard score in the final minute of the first half, then exploded for the longest offensive touchdown in the league this season on a 92-yard scoring scamper in the third quarter. The rookie second-rounder is quickly making a name for himself in a starting role, but owners will have to look elsewhere at the running back position in Week 11 with Cleveland on bye. Chubb carried the ball 22 times for 85 yards and scored a touchdown during Sunday's 37-21 loss to the Chiefs. He also caught his only target for five yards. Analysis: Since taking over the starting job for the jettisoned Carlos Hyde in Week 7, Chubb has averaged 3.9 yards per carry and has yet to eclipse the century mark. However, his workload and knack for finding the end zone makes him a solid play in fantasy formats, especially considering no one on Cleveland's roster is challenging him for carries. The rookie running back will look to keep it up in Week 10 against a Falcons defense that allows 112 rushing yards per game. Chubb ran for 65 yards on 18 carries and added 10 yards on two receptions during Sunday's 33-18 loss to Pittsburgh. Analysis: Cleveland continues to feed Chubb following the trade of Carlos Hyde, with 18 carries in each of his two starts after just 16 carries during the season's first six games. 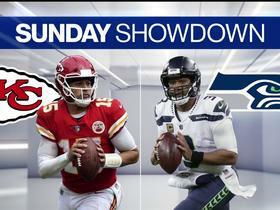 The rookie looks as though he'll be given every opportunity to develop in a season that is fading fast, and he should enjoy a more favorable matchup next Sunday against a Kansas City run defense surrendering 5.2 yards per carry, a full yard more than the Steelers'. Chubb rushed for 80 yards and a touchdown on 18 carries during Sunday's 26-23 overtime loss to Tampa Bay. Duke Johnson is listed as the Browns' starting running back for Sunday's game against the Buccaneers, but Chubb could still handle the bulk of the carries for the team, Mary Kay Cabot of Cleveland.com reports. Chubb isn't listed as the starting running back in advance of Cleveland's Week 7 matchup against Tampa Bay, Nate Ulrich of the Akron Beacon Journal reports. 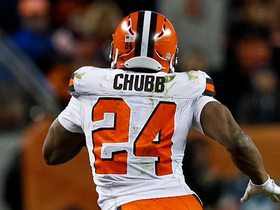 Chubb is expected to head the Cleveland backfield for the foreseeable future after Carlos Hyde was traded to the Jaguars on Friday in exchange for a 2019 fifth-round pick. Analysis: Duke Johnson remains on hand to handle change-of-pace duties, but the departure of Hyde paves the way for Chubb to see an immediate and significant increase in carries. He becomes a must-add for any fantasy player looking to add depth at running back. Chubb had made the most of his limited role behind Hyde over the first six weeks of the season, carrying 16 times for 173 yards and two scores. Chubb ran the ball three times for 25 yards in Sunday's 38-14 loss to the Chargers. Chubb carried three times for two yards and failed to catch his lone target during Sunday's 12-9 overtime win against the Ravens. Analysis: Despite Chubb's two-touchdown, 105-yard performance Week 4, the rookie running back didn't see an increase in work Sunday, as expected, and was shut down during the rare times when he did touch the ball. He did, however, see more field time, as he increased his snap count from three to 11. Chubb hasn't garnered more than three touches in any week this season, and that doesn't figure to change with Carlos Hyde and Duke Johnson firmly ahead of him on the depth chart. 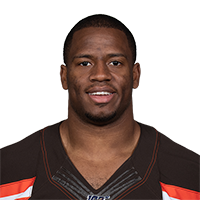 Chubb could be bound for more carries in Sunday's game against the Ravens after rushing for 105 yards and two touchdowns on his three totes in the Week 4 loss to the Raiders, Patrick Maks of the Browns' official site reports. Chubb carried three times for 105 yards and two touchdowns during Sunday's 45-42 overtime loss to the Raiders. Analysis: Virtually all of Chubb's production came on long touchdown runs of 63 and 41 yards in the second and fourth quarters, respectively. He was much more effective than starter Carlos Hyde, but the veteran still finished with 22 carries and a touchdown of his own. Hyde should dominate the touches again next Sunday against the Ravens, but Chubb could enjoy a few extra carries after this electric performance if the former struggles again. Chubb ran the ball two times for 14 yards during Sunday's 21-18 loss versus the Saints. Analysis: Though Chubb wasn't involved in the offensive game plan save for his two carries, he looked impressive when he touched the ball, gaining six and eight yards, respectively. Barring an injury to starter Carlos Hyde, the rookie out of Georgia likely won't see much more work going forward than he did Sunday, but the potential is there, making him a must-own in dynasty formats. Chubb rushed three times for 21 yards during Sunday's 21-21 draw against the Steelers. 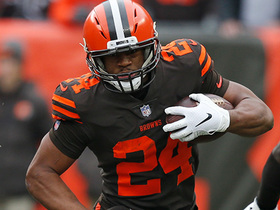 Analysis: Of Cleveland's trio of running backs, Chubb saw the fewest number of carries in his first professional game. Carlos Hyde dominated the touches with 22 rush attempts, while Duke Johnson added five. That workload share seems likely to continue as the season goes on while Chubb gets acclimated to the NFL, but the rookie still showed his big-play ability when he broke off a 17-yard gain in the third quarter. Chubb took five carries for 30 yards and a touchdown in Thursday's preseason game against Detroit. Analysis: With Carlos Hyde and Duke Johnson predictably held out, Chubb got the start and saw all his work on the opening drive before handing things over to Matt Dayes. The rookie second-round pick bounced back strong after opening the preseason with a 15-carry, 11-yard performance, taking 30 carries for 129 yards and two TDs over the final three games. Chubb will enter Week 1 in the third spot on the depth chart, but he's next in line to serve as the lead runner if Hyde gets injured or demoted. Chubb rushed 14 times for 46 yards during Thursday's 5-0 preseason victory over the Eagles. Analysis: Chubb saw the bulk of the action among his fellow running backs Thursday, but aside from his 21-yard run on his first carry, the rookie didn't do much with his workload. Carlos Hyde, on the other hand, nearly matched Chubb's rushing total with half the number of carries. 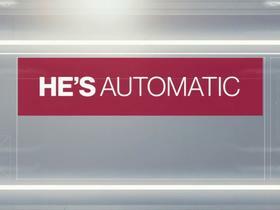 The former Georgia Bulldog still figures to have a role on Cleveland's offense behind Hyde and Duke Johnson, but he'll need to produce if he expects any meaningful playing time. Chubb took 11 carries for 53 yards and a touchdown and caught two passes for no gain in Friday's preseason loss to the Bills. Analysis: Chubb took a big step forward from last week with gains of 17 and 14 yards, but it was Carlos Hyde who got most of the carries early in the contest on his way to a 9-64-1 rushing line. The rookie still has time to continue making his case for some work, but the Browns likely will give Hyde and Duke Johnson most of the playing time to start the season. Chubb rushed 15 times for 11 yards and caught one pass (one target) for 12 yards during Thursday's 20-10 preseason victory over the Giants. Analysis: Chubb was the only Browns back to see double-digit carries in the contest, but failed to make an impression. The fact he saw the bulk of the carries is encouraging, but at the same time, his underwhelming performance highlights the fact he's still behind Carlos Hyde and Duke Johnson on the depth chart. 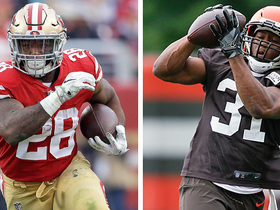 Browns running backs coach Freddie Kitchens expects to ride the hot hand between Chubb, Carlos Hyde and Duke Johnson this season, Andrew Gribble of the team's official website reports. 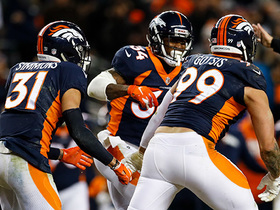 "Ultimately, all three of those guys can run our running game," Kitchens said. "Duke can do a few more things in the passing game." 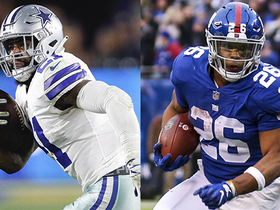 The "NFL Fantasy Live" crew discuss several Week 16 matchups and predict players' performances from the same position. NFL Network's "NFL Fantasy Live" crew spotlights players who you should start without question in Week 16. 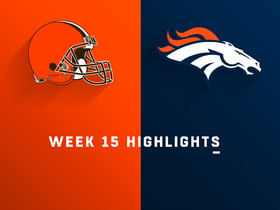 Watch complete highlights from the Week 15 matchup between the Cleveland Browns and Denver Broncos. 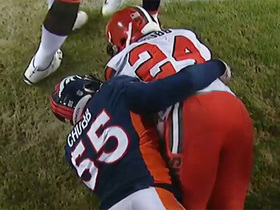 Denver Broncos defensive end Bradley Chubb makes his first tackle against his cousin, Cleveland Browns running back Nick Chubb. The Denver Broncos defense steps up on this critical fourth down stop. Cleveland Browns running back Nick Chubb breaks loose for a clutch 40-yard gain.